The eating was easy. I made a pavlova for last weekend's birthday lunch and here it is. Coming out of the oven it was puffed up high but the top cracks as it cools, leaving a crunchy top and a marshmallowy centre. In my family we just like to smother it in whipped cream and strawberries but passionfruit is served on the side for all those Australians who believe a pavlova has to have pash n'strawbs. Fruit salad is also popular but I think it's a bit messy for my pav. There is a huge conflict in Australia and New Zealand because country claims to have invented the 'pav', a dessert originally made for the ballerina Anna Pavlova. I don't care where it originated, just so long as I can keep making them. 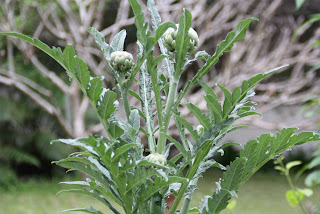 In the garden I am very excited to see my first globe artichokes appearing on my one and only plant. This is such a beautifully architectural plant that I'd forgive it for not producing anything at all, but I am rather chuffed that these beautiful little chokes are growing fatter by the day. Now I'm torn between whether I actually eat them or let them develop into the most magnificent thistle flowers. For many years I daily drove past a paddock of neglected artichokes and I was captivated by the huge blue flowers in spring and summer. At last I have my own; and perhaps my garden isn't big enough to have a giant thistle spreading seeds everywhere. Also in the garden we have two big lizards. One is an Eastern Bearded Dragon, quite big, very harmless, no photo so far. The other is also big, also harmless, and like the Dragon, loves to sit in the sun for hours on end. This fellow (I think) is a Blue Tongue Lizard, nearly two feet long, and we are thrilled to have them both in our garden. I took this photo this morning and I was about 4' away before he (or she) gave me a look and slowly moved away under some timber. I say I think he's a Blue Tongue but his very dark colour is making me a bit unsure, so if anyone has any better identification I'd be happy to hear it. By the way, a Blue Tongue Lizard has a very blue tongue. I've had many months of migraines and then, to my dismay, sciatica - so I've had quite a lot of time on my hands when I couldn't really concentrate to read or do anything else much. So I've been playing with old paperbacks, something I did many years ago but had forgotten about. This is, I suppose, an altered book, and if I'd been feeling more capable I'd probably have tried to make it a lot more perfect. As it is, my faulty attention span has given it a few strange folds - but I rather like it. 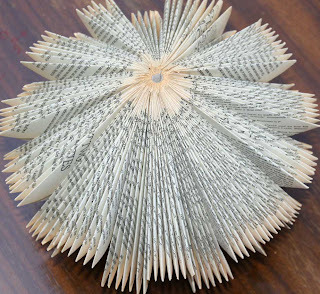 I think now I'd like to bind a book just for this purpose, and do some experiments with shape. I've unearthed all my book binding books - what a treasure trove that I've been missing for the past 18 months. I thought I should tell you about one each time I post. I'm not very good at reviews because I seem to have an inability to be critical of everyone's work but my own but I'll get around that by telling you what I particularly like. The first is The Book as Art: Artists' Books from the National Museum of Women in the Arts, by Krystyna Wasserman with essays by Johanna Drucker and Audrey Niffenegger, c2007 NMWA. This is a substantial book, hard covered, lavishly illustrated, often with just one artist to a double page spread. Each artist's book is generously displayed with a simple description and the artist's statement. The essays by Drucker and Niffenegger are a valuable addition to the book, readable and fascinating insights into these two highly regarded book binders. 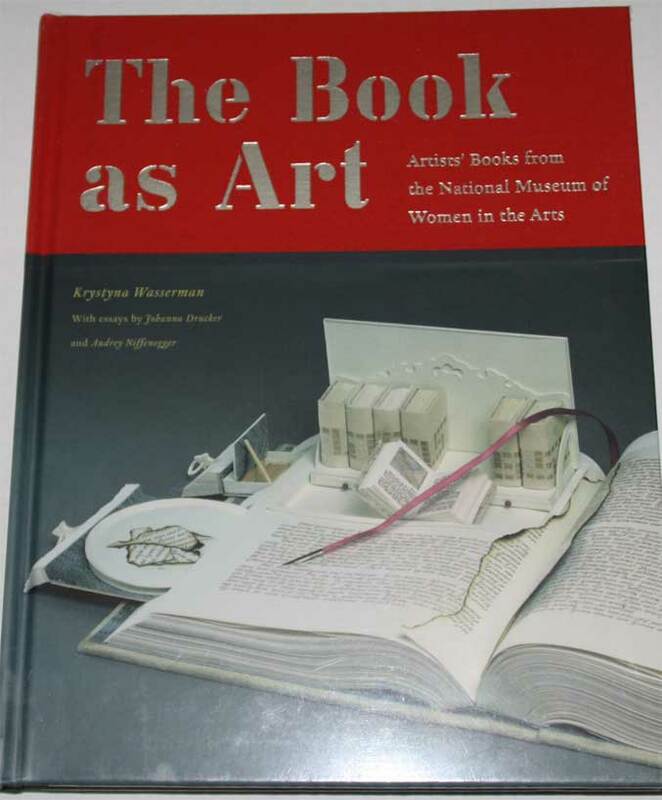 Krystyna Wasserman's introduction to the book and to the National Museum of Women in the Arts has me determined to visit the museum if I manage to return to the US. I can't believe I've spent weeks in Washington DC and didn't know of the existence of this museum which houses over 800 artists' books! This shows 108 of those books, and thank goodness, has a comprehensive index. 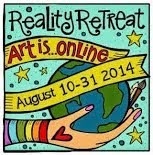 The listed artists read like a who's who of book artists I've heard of and many I haven't. The label on the back of the book tells me I paid AUD$110.00 for this book in 2007. Pricey, so unless you're obsessed with owning every last book, I'm sure this is one your library would get for you on Inter Library Loan. Do let me know what you think. Sorry to read you have not been well, but the folded book looks very appealing! - So maybe there is a good hidden somewhere in the bad. Hope you will be better! 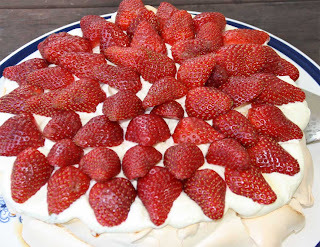 oh, and the pavlova looks so delicious! The picture really make me want to try and make one some time. Not sure about your lizard, Carol. 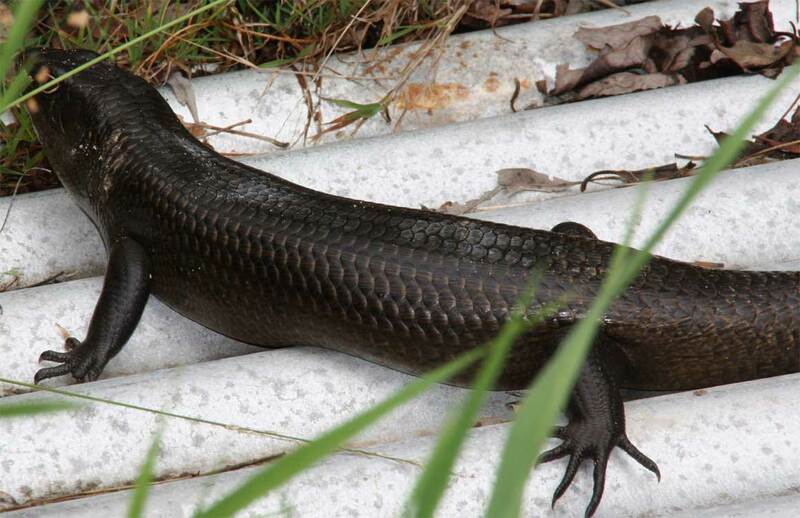 The colour/pattern is not Blue Tongue, but it may be a skink. Hard to tell from the photo and, anyway, I know sod-all about southern critters! I also like your folded one.And the artichoke!The pavlova? Not so much. Sorry! ps love your folded piece - and also loved the book - borrowed from monash library of course! Your post had lots of interesting elements. I especially liked the details of the Pavlova and plana to google a recipe for it. I also like the picture of your book and garden lizards. Hilke & Cheryl: Thanks, I'll send you my pavlova recipe. Di: Yep, colour and pattern don't match any pics I've found of blue tongues but do skinks grow to 2 feet? And very, very wide in the body? I think I'll send the photo to my buddies at the museum for ID. Ronnie: Okay, I'll let these develop into flower and seed heads, eat them next year. And I'll plant more, too. I might have mislead you there! Blue tongues are in the skink family and, yes, some are quite big, but I really don't know much about them.I did have a bit of a google to see if, perhaps, some have seasonal variations, like coming out of dormancy, or a "pre-mating wardrobe change." Well, humans do! Thanks Di, you're right, he (no, probably she) is a skink and here's the reference. It is called a Land Mullet Egernia major (so a different genus as well as species!). More detail can be found here – they do apparently taste like fish! Oh, YUM! Pavalova! It's from NZ ofcourse:) No question about it! lol. It's one of my fave because I can still eat it with my food allergies. Sciatica is huge pain, litteraly. I get it often and usually it's a dull ache but when its not...hope its settled down for you now. Your book binding treasure trove is something I would LOVE to get my hands on! I love your wonky folded book, it's got a more organic feel to it than a precise work. Oh, and lizards? How cool! Lisa: I'm happy to humour you over the origin of the pavlova. As I consider NZ my second home I have some split loyalties and this is one of them. And the lizards are just beautiful, so pleased to have them make their home in our garden. "land mullet" Hmmm...not sure I want to do the taste test! That pavlova looks gorgeous! I hope you are feeling better. I like your lizards. You are very lucky to have such fabulous creatures in your garden. The altered book looks beautiful and the folding looks great to me. I wouldn't have the patience to do that under normal circumstances, never mind with a migraine and sciatica! Hello Carol!Something weird happened with blogger (again) and I just saw your post this morning! Anyway, really sorry to hear that you have sciatica AND migraines, both ends, so to speak!! Still it seems from your folded book you have found a wonderful way to pass the time. 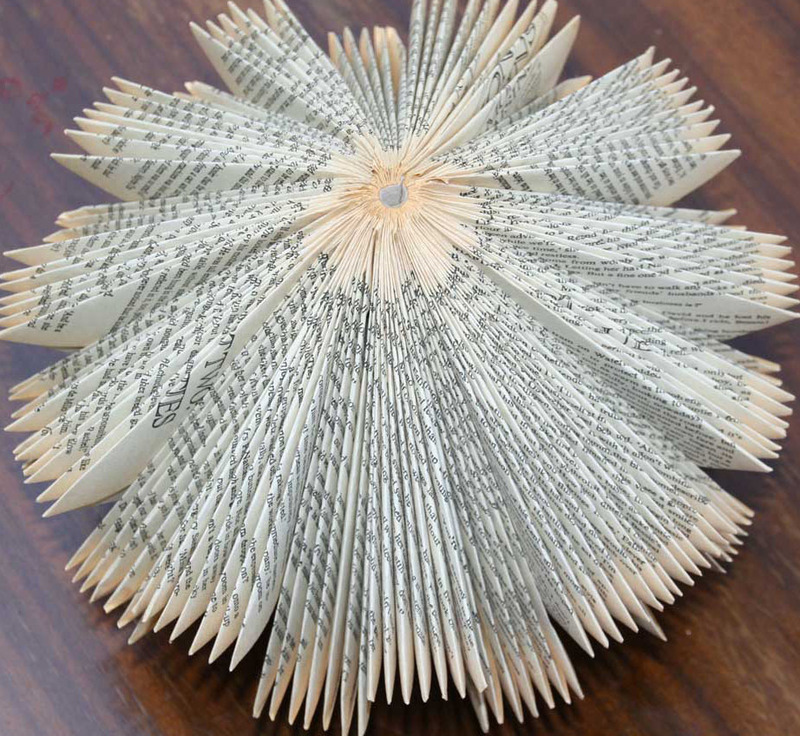 That is something I think the book arts offers - a wide range, from fairly simple, repetitive tasks, to craft to wild creative adventures, which to me says there is a book arts activity to suit every mood! Well nearly! Your liz is very impressive, but since the blue tongues started entering our house in search of the dry cat food (which they love and grow very fat on) I've been a bit less enamoured of them. You don't want to step on one with bare feet - it'll give you a heart-attack! yikes: I'm the 16th comment...haven't read any of them but wonder what has caught the most attention: the lovely Pav, the wonderful artichoke, the horrible looking lizard (2 feet long! YUCK!) or your wonderful paperback book art. We are having great Pav baking weather, but I'm so snowed under right now, that I really think you should drop by and whip one up for me! Hope you are feeling better. Migraines and sciatica are bad enough on their own, but having both is entirely too much! Be well Dear Heart! Argh, Sydney libraries don't have it. I went to a talk by Audrey Niffeneger as part of the Writers Festival a couple of years ago, but I don't remember even knowing she was a bookbinder. I have this book too!